GLOGIRLY: Is It Da Plane? Is It Da Bird? I've decided to give the UPS man another chance. All that door knocking and doorbell ringing....I'd about had it with him. He brought me a big long tube all the way from the UK! My friend Austin at (CAT)achresis sent me a pressie for helping him fancy-up his blog. I've heard stories about Da Bird. I've read reviews of Da Bird. I've even seen many of you in action with Da Bird. Well kitties, I have died and gone to heaven. In fact when I really do show up at the pearly gates, I'm certain they'll be handing out Da Birds to ALL the kitties. Did you know that it spins and flutters through the air just like a REAL bird? I played so hard I needed a second dinner and then went off to bed early. Must sleep. So tired. Will dream of Da Bird. ::twitch:: Da Bird??? oooooohhhhh....I LOVE IT. Oh Da Bird!!!! Da Bird is Da Best! The fluttery sound just drives everyone wild! What a cool thank you gift! Hi Katie, that looks like a great gift. YEY ! So happy to see you in action and so happy to finally get to know what Da Bird is ! Katie, you are SO right - Da Bird is Da Best! Katie, you have been so clever in the past, not revealing that you actually ARE a cat. Your secret is out now. Enjoy your Da Bird!! Do you realise that Da Bird is British, Katie? 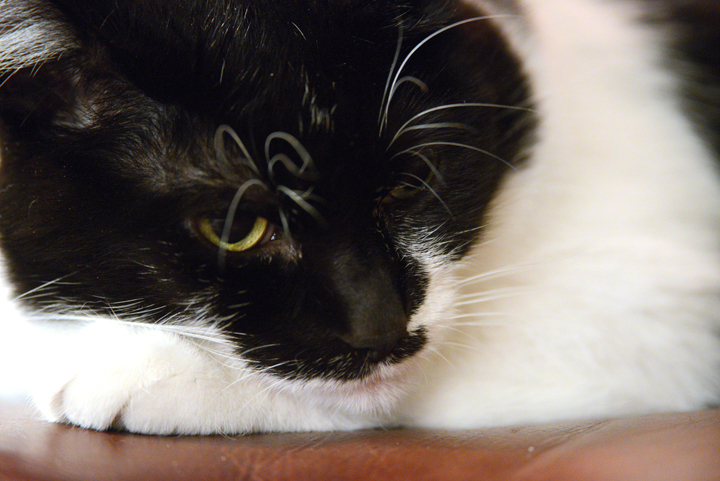 purrr....meow! We LOVE da bird, too. The humans keep it in a place they call the garage. So every time they open that door, Newton comes running to see if da bird is coming inside! Have fun with your da bird, Katie! Da Bird is one of our favorites too! 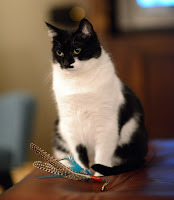 The mom has to keep it in the closet when we're not playing with it, because we'd chewed the heck out of those feathers! We've already destroyed one! Wow, Katie, what a great surprise delivery! We have something similar, but it doesn't really interest us that much...mostly because we have an inept servant to manipulate it! I sy this with utmost respect nd sincerity. You look like a cat in a dog's suit. So fluffy and big. Congratulations on your super cool pressie. 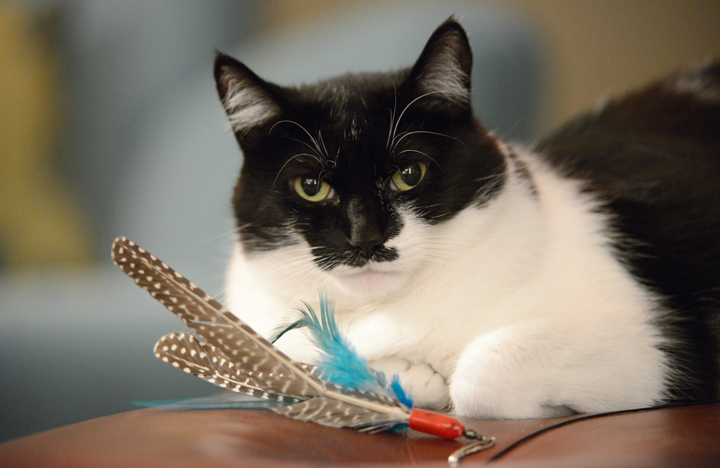 Katie, you look so lovely with your feather! katie I agree with you. I think it is the BEST toy EVER! I LOVED MINE..."LOVED" being the operative word. Mommy hid mine because she didn't want me eating the feathers (like I am stupid!) and now the brainiac can't seem to find where she hid it. Enjoy yours before it suddenly disappears too! 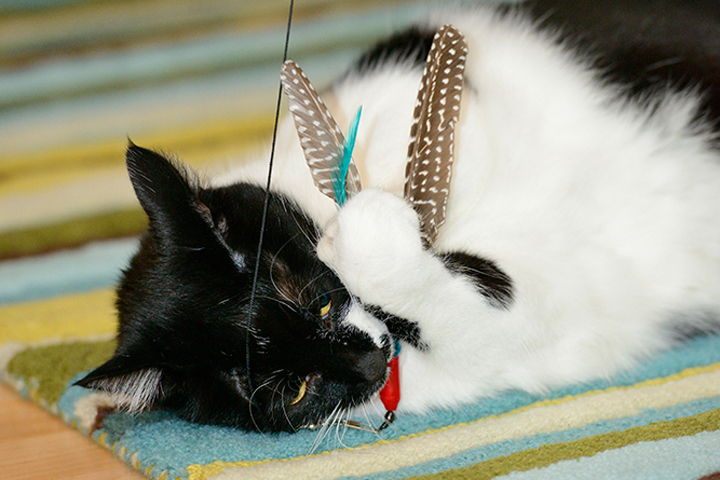 Da Bird is abso-freaking-lutely THE BEST toy On. The. Planet. Which makes sense because it's... A WAND Toy! Maxwell: well, that and the Neko Kragonfly. Does yours mysteriously disappear after playtime is cut abruptly short, too? we knead ta haza talk with austin !!! Da Bird is so much fun! One of my boys loves it and he flies in order to catch it! Glad you enjoyed so much! 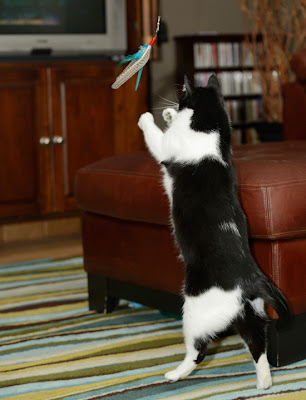 how very cute - I not much into da bird - but I do chase 'da red dot. Does nothing for me, sorry. I'm afraid that red thing on the bottom is gonna clock me and knock me out. The cat that came before me Autumn LOVED it. Now you can drive GG crazy by having a one-track mind and dragging it through the condo all day and night. Tell her it'll help you lose weight so you won't have to be on a diet. That good huh? Guess Quill needs one. Katie - we gave you an award in today's posting. Check it out! Da Bird will drives yous wild!!! Oh beautiful girl...what a wonderful present for you. And I am so glad you liked it so much. I love mine to. I inherited it. Heeeee.